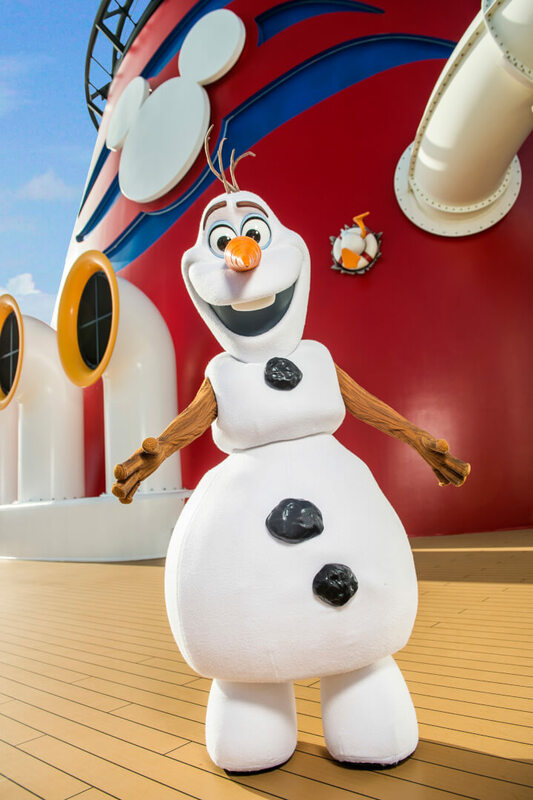 Now that “Frozen” has found its way into Disney’s theme parks, the hit film is headed for the high seas as Disney Cruise Line announces new entertainment for its ships. 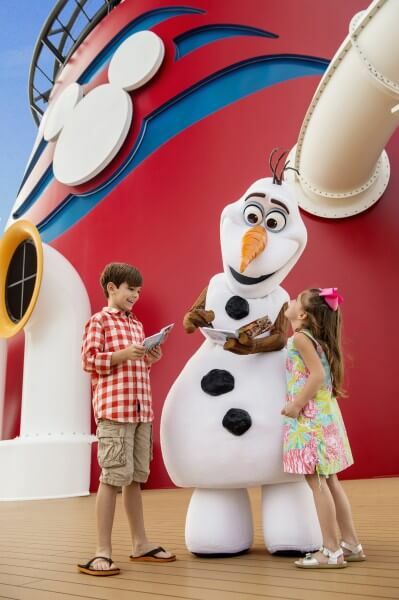 Beginning in summer 2015,a deck party, a three-song stage show production number, new character meet and greets, and more will be added to the Disney Magic and Disney Wonder ships, with some new offerings also slated for the Disney Fantasy and Disney Dream. On select Disney Magic and Disney Wonder sailings to Europe and Alaska, Disney Cruise Line guests will awake to find a “magical freeze” has taken over the ship’s atrium lobby, resembling the majestic mountain-top ice palace of Queen Elsa. This party will feature a line dance set to the movie’s ice cutting scene, featuring the arrival of Kristoff and Princess Anna. Sven, the trolls and Olaf will make virtual appearances and Elsa will arrive with a snowy gust of wind, calling on guests to sing “Let it Go” with her. Aboard the Disney Magic, the “Disney Dreams” stage show will add new scenes featuring “Frozen” characters ,include renditions of three popular songs: “Let it Go,” “For the First Time in Forever” and “In Summer.” including special effects. Olaf, Anna and Elsa will all be meeting and greeting aboard the Disney Fantasy, Disney Dream, Disney Wonder and Disney Magic. For those who sail to the real country of Norway, a “Frozen” inspired excursion in Ålesund, Norway, created exclusively for Disney Cruise Line, will feature Anna and Elsa in a storybook village. Castaway Cay will debut Olaf’s Summertime Freeze bar, serving non-alcoholic specialty frozen drinks in souvenir cups, such as “Olaf’s Flurry Freeze,” “Sven’s Carrot Delight” and “Warm Hugs.” Olaf’s Summertime Freeze opens summer 2015 near the Pelican Point tram stop by Castaway Cay Family Beach. What’s interesting to me about all of this Frozen stuff is that Disney is in a can’t win situation: if they don’t do Frozen things, then people would complain and criticize because they aren’t giving people Frozen stuff. If they do the Frozen stuff, they are criticized for doing too much Frozen stuff. What I think the real issue is here is that Frozen is a phenomenon that will play out until there is a next phenomenon. Will Frozen 2 be as compelling and have new characters that become a cultural hit? Doubtful. Disney should be gearing up a Rumpelstiltskin or Hansel & Gretal or something. Another European fairytale that could be big like Frozen. The polynesian thing they are doing next looks okay, but is not going to be a giant cultural hit like Frozen. Here’s the thing with Disney doing Frozen stuff in parks and on the ships, first off let me say that I love Frozen. I live in Florida and was able to get up to Disney for the Frozen Days of Summer in Hollywood Studios and for the “Freezing” of Cinderellas Castle in MK, both were pretty cool shows visually. The problem that I have with them is there is nothing new to them at all in terms of writing. The shows come across as bad spin-off stories “You know the audience seemed to like it when the sisters said they like chocolate, why not put that in EVERY SHOW” and it’s ripped right out of the movie “What’s that smell ::SNIFF:: CHOCOLATE!” It has been in ever show that centered around Frozen I’ve seen, even the quick show before the fireworks under the Hat at Hollywood Studios. I would like to keep seeing more Frozen shows/attractions, it’s nice to see Disney embrace a movie the way that they have, I can remember 1 show and 1 dark right that I may or may not have dreamt up for the Lion King. So what they are doing is refreshing in a way they need to not keep rehashing the same jokes and lines over and over again. The problem with shows at a place like Disney is that they have to appeal to families who might come once in a lifetime or once every 5 years. So, while you might not like hearing the same jokes again and again, people who are making their first trip to the parks (or one of only two trips they will take in their child’s entire childhood) would go home disappointed if they did not hear that “chocolate” joke. It’s kind of like political speeches. If you ever follow a candidate and go to different events, the candidate says the same speech more or less every time. The lines that work and get a response from the crowd are highlighted and put into the next speech. And they keep using them until crowds no longer give a good response to them. It’s the same thing with Disney. What I think becomes a problem is when grown adults go to Disney parks frequently without children. The adults think the parks are for them. They are not. The parks are for families. Always have been. Always will be. The parks are not for middle-aged men or single super fans. Little kids love familiarity and repetition. Taking out the chocolate joke just because Brice heard it before would never happen…because tons of little kids who have never been to a Disney park before have never heard that joke and it’s guaranteed to get a laugh.